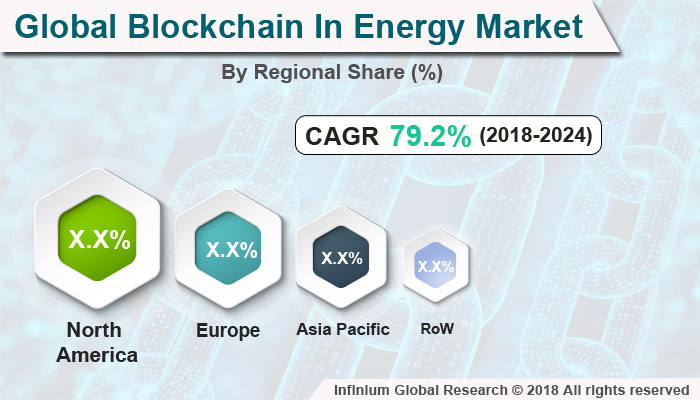 A recent report published by Infinium Global Research on blockchain in energy market provides in-depth analysis of segments and sub-segments in the global as well as regional blockchain in the energy market. The study also highlights the impact of drivers, restraints, and macro indicators on the global and regional blockchain in the energy market over the short term as well as long the. The report is a comprehensive presentation of trends, forecast and dollar values of global blockchain in the energy market. According to the report, the global blockchain in the energy market is projected to grow at a CAGR of 79.2% over the forecast period of 2018-2024. The blockchain is an emerging technology. Blockchain technology came into limelight with the introduction of cryptocurrencies. The blockchain is a peer-to-peer distributed ledger technology that works through 3 major components namely distributed network, shared ledger, and digital transaction. Blockchain technology offers several benefits such as increased transaction speed, reduces data duplication, fewer chances of failure and high governance & trust. Blockchain technology is currently disrupting several industries with incredible improvements in the existing business models. Currently, blockchain technology is making a considerable impact in the healthcare sector. In healthcare systems, information on the patient’s database is stored in bits and pieces. Healthcare system lacks a centralized information network system through which patient’s data can be easily accessed at the times of need. Besides this, is information stored on physical memory of a particular system of hospitals can get corrupt within or the information can be altered through anyone who has access to that system. Blockchain in healthcare offers security, scalability and data privacy. Healthcare industry generates a vast amount of critical such as health records of patients, medicine and hospital billings, information on procurement and utilization of drugs and information on clinical trials. This several critical information is always unorganized and scattered across various systems. Blockchain technology is used to compile disease registries, inpatient records, and information on supply and demand on drugs. Thus, this can help governments as well as hospitals to make necessary and precautionary arrangements for the future. Electronic health records are one of the one growing trends owing to increased use of cloud-based EHR software, the rapid surge in aging population, and subsequent rise in the number of chronic diseases and instant availability of real-time patients records. Here, blockchain can be utilized to make the EHR more reliable. Besides this, blockchain can transform revenue cycle management, drug supply management, and clinical trials to prevent frauds. Going further, claims and reimbursement policies can be automatically verified and there would be fewer frauds or manipulations. These above-mentioned factors are driving the adoption of blockchain in healthcare. However, difficulty in integration with the existing system and the high cost of deployment can slow down the adoption of blockchain in technology. Among the regions, North America holds the maximum market shares in the blockchain market. The high adoption of advanced technology and the growing application of blockchain in healthcare are expected to contribute to the growth of the blockchain technology market across North America. Besides this, the presence of blockchain technology offers several benefits to healthcare institutions. In addition, investments made by healthcare institutions to upgrade and modernize their infrastructure and information system boost the growth of the blockchain technology across the healthcare segment. In addition, Asia Pacific is expected to be the fastest growing region in the Blockchain technology market owing to the growing adoption of the blockchain across various industries owing to growing healthcare infrastructure. The report on global blockchain in energy market covers segments such as component, type, end-user, and application. On the basis of the component, the sub-markets include platform and services. On the basis of type, the sub-markets include private, and public. On the basis of end-user, the sub-markets include power sector, and oil & gas sector. On the basis of application, the sub-markets include grid management, government risk, and compliance management, energy trading, supply chain management, and others. The report provides profiles of the companies in the market such as IBM, Accenture, AWS, Gd+, Oracle, BigchainDB GmbH, Microsoft, Nodalblock, Power Ledger Pty Ltd, and BTL. The report provides deep insights into the demand forecasts, market trends, and micro and macro indicators. In addition, this report provides insights into the factors that are driving and restraining the growth in this market. Moreover, The IGR-Growth Matrix analysis given in the report brings an insight into the investment areas that existing or new market players can consider. The report provides insights into the market using analytical tools such as Porter's five forces analysis and DRO analysis of blockchain in the energy market. Moreover, the study highlights current market trends and provides forecast from 2018-2024. We also have highlighted future trends in the market that will affect the demand during the forecast period. Moreover, the competitive analysis given in each regional market brings an insight into the market share of the leading players.